Although I own three field guides to Australian birds, I was influenced by a colleague to take my birding “to the next level” and try the The Michael Morcombe and David Stewart eGuide to the Birds of Australia. I diligently bowed to peer pressure and downloaded the free, ‘lite’ version which gave full functionality for 59 species. Although the app had many limitations, I quickly realised how useful it would be in the field, so I happily shelled out $32 for the full version. Size matters when you’re out birding! 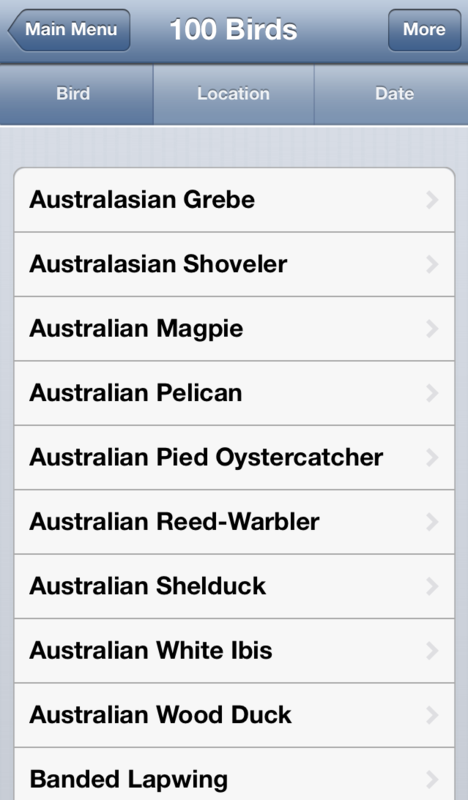 The app allows you to quickly scroll through hundreds of species, grouped alphabetically or taxonomically. Each species has a thumbnail image next to its name, making bird identification potentially much faster than using the table of contents or index in a field guide. The thumbnails on an iPhone are, of course, tiny, so it is difficult to tell the difference between a Yellow-plumed, Grey-fronted and Fuscous Honeyeater without having to tap to open each entry. This isn’t a problem if you know exactly what you are looking for or if you are an expert birder, but for quick comparisons, expect a few too many taps. Use thumbnails of just the bird’s head (as is done for some of the prions and shearwaters). The app allows comparisons of two species at a time – even totally unrelated ones – regardless of if they bear a passing resemblance or not. This is extremely useful in the field for those ‘little brown jobs’ as an alternative to flicking back and forth between pages in a field guide. Allow comparisons of multiple birds and/or have pages with multiple related/similar species. The app allows you to quickly record sightings, including GPS coordinates and additional comments. You can sort data on your iPhone by species, location, and date, and your list can be exported via email as a CSV/Excel file. Allow the creation of multiple lists, all reporting to a master ‘life list’. The distribution maps are quite accurate, and as mentioned earlier, the app allows you to record the GPS location of a sighting. The GPS coordinates of sightings are stored, but they are not plotted on a map. 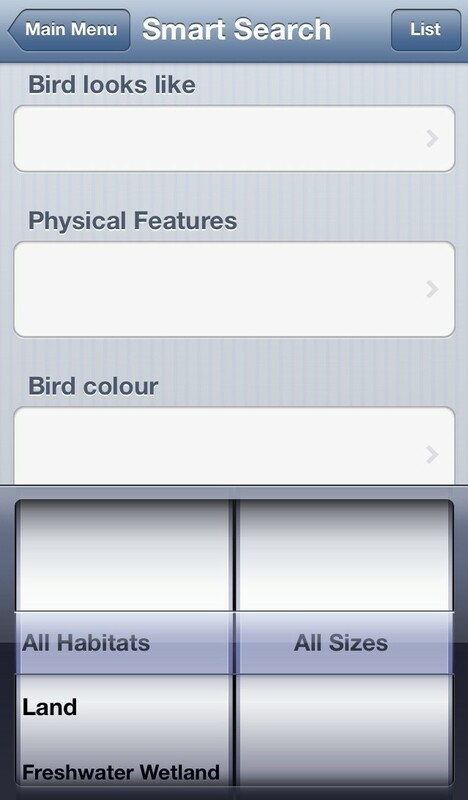 Also, the app does not have maps of birding hotspots, and lists are not integrated with any online bird databases. 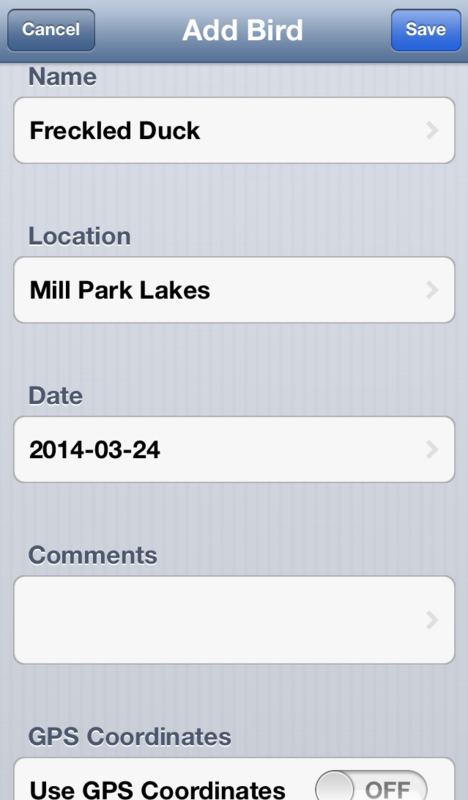 Include option to share sightings with other app users. The lite version of the app (with 59 species) is free, and the full version is a relatively cheap $32. When first released, the ‘Pizzey and Knight app’ was $70 on iTunes, but the price has since dropped to $50. 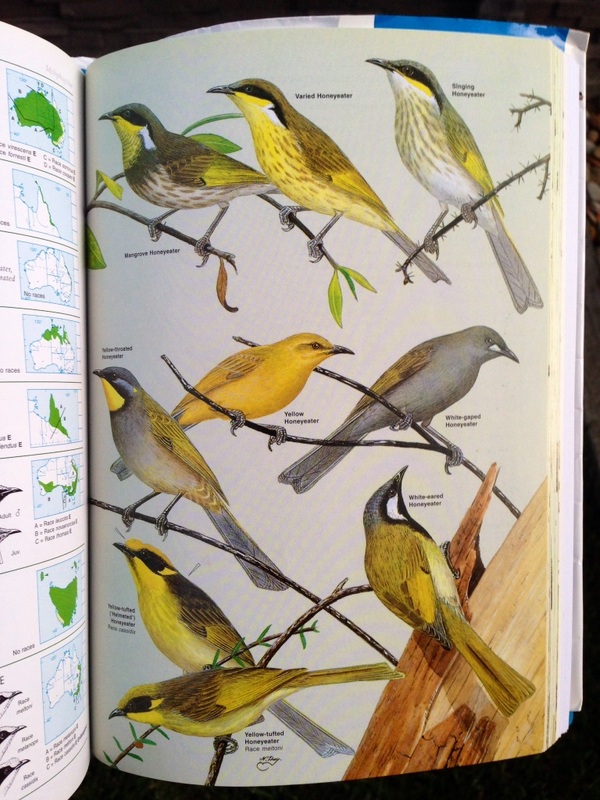 Paperback field guides to Australian birds, for comparison, range from $20-$35 on Amazon.com. There are at least 10 free apps on iTunes for birding aficionados. The free ‘Aust. Bird Guide app‘, for example, is a great addition to the ‘Morcombe app’, since it includes photos and information uploaded by users. However, the user-contributed content is as accurate as a Wikipedia page. Depending on where you are visiting, the ‘Director of National Parks’ may have a free app. Be warned though: even for a birding hotspot like Kakadu, their app only covers 50 species. The free ‘Museum Victoria app‘ fares better with about 145 bird species plus scores of entries for mammals, reptiles, fishes, and amphibians. So although the ‘Morcombe’ and ‘Pizzey and Knight’ apps may be quite comprehensive and accurate, a casual birder could theoretically get good coverage with a motley collection of free apps. Include an extensive library of high-res photos of each species. The app has a ‘Smart Search’ feature which allows users to search for a bird that, for example, looks like a honeyeater, with an upcurved bill, that was red in colour, was spotted on mudflats, was about 30cm long, and wasn’t a passerine. There aren’t any birds like that of course, but the app’s ‘Smart Search’ feature is a powerful tool for those fleeting glimpses, blurry ID photos, and novice birders. 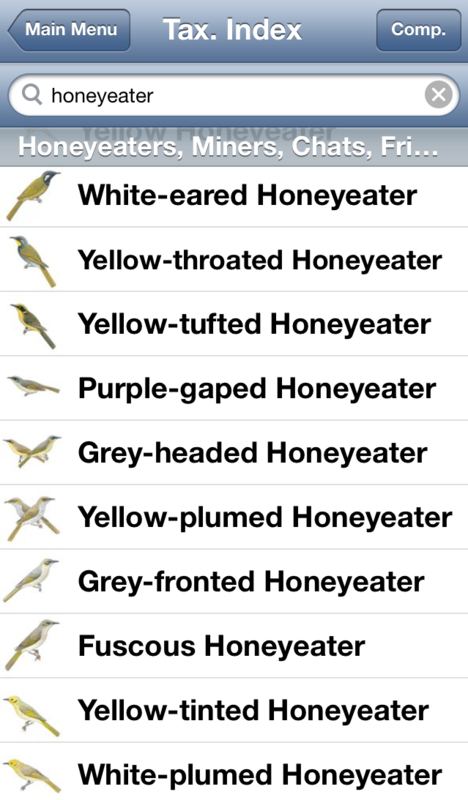 The standard search feature isn’t very smart: for example, if you searched for “yellow honeyeater”, the only result you would get is the ‘Yellow Honeyeater’ as compared to all the honeyeaters with the word “yellow” in their names. Indeed, you have to type the exact name (like yellow-tufted, yellow-faced etc) to get a result. This is in stark contrast to doing a Google search. To own a new, updated edition to a field guide, you have to purchase it. This means that you either shell out cash regularly for books with sometimes just minimal changes, or you remain contented with a field guide written when the Paradise Parrot was still extant. With an app, however, updates are pushed out as regularly as the developers choose to, and are free of charge for the life of the app. If you choose to change to a different phone with a different operating system and market place (e.g. moving from an IOS iPhone to an Android Samsung Galaxy, and from iTunes to Google Play) you will lose the app. Also, updates to improve functionality of the app are not very regular, with the last one being in March 2013. Indeed, a reference to the egg of a ‘White-throated Scrubwren’ – such a bird does not exist – in the entry for the Speckled Warbler has not been corrected, when a simple update would probably suffice. Release regular updates that incorporate user feedback and improve the user experience. 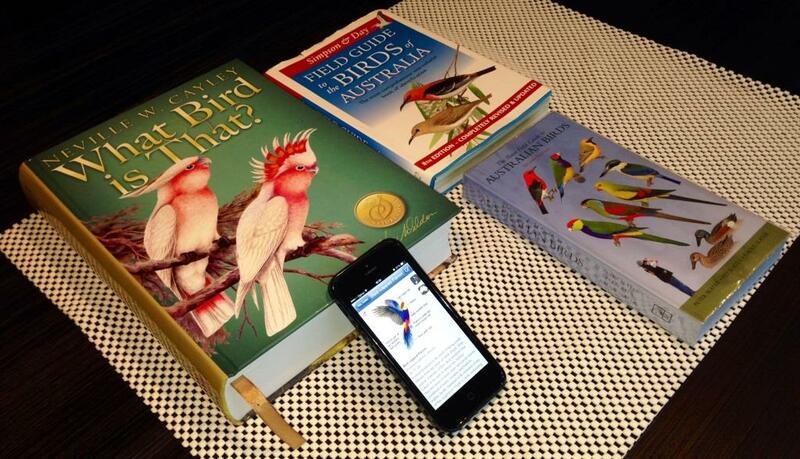 This is where a field guide is incomparable to the app: the latter gives you access to the calls of 650+ species. This powerful tool is useful in the field when trying to identify the call of a particular species, or when trying to attract a species with playback: armed with just an iPhone and the app, there is no need for additional audio equipment. Not a con per se, but with great power, comes great responsibility: there is the temptation to use the recordings excessively to attract birds. Many birders surmise that this is unethical, since it interrupts the birds’ normal behaviour (i.e. tending to young, feeding, looking for a mate, nest-building etc. ), while other birders purport that playback helps in recording the presence of rare species for conservation purposes. The app developers seem to be approaching this app as they would the printed version. They probably view ‘updates’ as consisting of taxonomy changes/addition of information that only need to be released as regularly as new printed editions. However, anyone tech-savvy enough to purchase this eGuide, will already be accustomed to a world of free, regular app upgrades to improve functionality and the user interface. It is here that there is much room for improvement: the app developers should adopt an agile framework where user feedback is incorporated into regular updates with incremental changes, rather than release a massive, annual (?) overhaul. The current version of this app (and indeed, any birding app) can never replace a tattered field guide – the latter transcending hardware/software obsolescence, while eliciting fond memories of past birding outings from every stain, tear, and hand-written record. However, you can’t go wrong with a $32 pocket-sized field guide with hundreds of bird call recordings. Don’t take my word for it though: download the free, lite version and judge for yourself. Thank you for this great review. I have Morcombe’s field guide and I’ve been thinking about buying this app, but I’m not sure how useful it would be for me at this time. I’m a beginner and I often find myself thumbing through the field guide. I can’t always even identify the general family group so the app’s search algorithm might not be very helpful. Although it’s big and heavy, I can see the birds easily in the field guide. Perhaps I’ll wait on this app until I have some more experience. 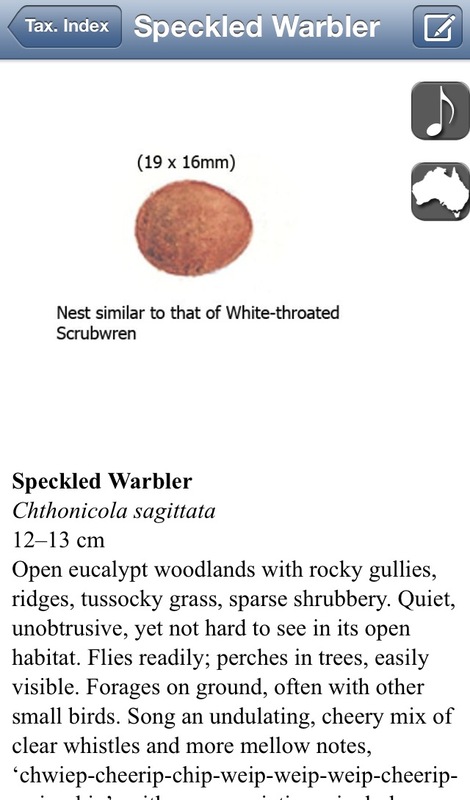 The latest version has a “Gallery View” dispay of illustrations, eg all fairy wrens together etc. 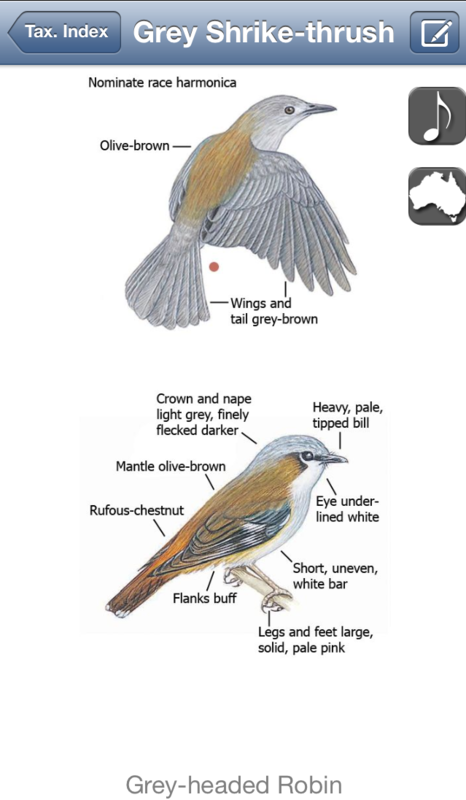 further, this can be modifued by region, colour etc to show all fairy wrens in your region with, say, red in plumsge. Michael, it is indeed an honour to know that you have read and commented on my blog-post. I quite like the “Gallery View” feature in the most recent app update (which was released after this blog-post was published), and will be updating this review accordingly in due course. I, along with other birders, look forward to the app being updated more frequently, especially with a feature that allows users to keep multiple lists that report to a life-list. Hi Mike. Many thanks for your comment/question. I suspect that you may be referring to the free LITE version which has a handful of species merely to give potential buyers a feel for the usability and depth of the app. The full, paid version has entries for about 790 species, including 8 owls and 5 fantails (I just checked the app on my phone). However, assuming you have the full, paid version, did you change your settings to a particular geographic zone? In the ‘menu’, I have ‘My Location’ set to ‘off’ and ‘all species’, as compared to, say, ‘Tasmania’ and ‘vagrant’. Give this a try and let me know how you go. Hi I have previously purchased your ebook for my iPad and have recently updated to a samsung galaxy. Is there anyway to get an android version, as a pensioner I cant really afford to spend that much to often? Hi Ralph. Thanks for your comment. Note that it’s not my ebook. I have no affiliation with the app developers – I’m just a birder like you who purchased the app. I feel your pain though, since this also happened to a pensioner friend of ours. Why don’t you email the app developers with your query? Surely they have a record of your purchase, and perhaps they can suggest a course of action. Their email address is support@mydigitalearth.com. Please let us know the outcome. Hello, I’ve been using your app for nearly 3 years and I keep my life list on my iPhone. I’d like to be able to see my list on my iPad. Can I transfer it? By the way, your app is on my iPad but the list remains empty. Hi Jannette. Note that it’s not MY app – I a birder like you who uses the app and wrote a review of it. Many thanks for reading the blogpost and for leaving a question/comment. As far as I know, lists don’t sync between devices because the app doesn’t ask you to log in to a profile. It would be a great feature to have though! Be sure to circle back and let us know what their response was. With regard to the Morcombe app on Android I can say that changing between devices is as simple as going to the Play Store and just downloading to the new device. There is no charge for this for the Morcombe app but have been told by the Pizzey and Knight web site that their product is strictly a one device licence. Hope this helps. That’s great to know – thanks for sharing! Are all your lists also downloaded to the new device?